Gain competitive advantages in spray drying with an HID™ Air Distributor (High Intensity Drying technology). • Up to 20% higher capacity compared to a conventional air distributor. • The multi-stage HID™ Air Distributor is more efficient – energy consumption can be reduced with up to 10 %. • The different inlet air temperatures and air flow velocities in the HID™ Air Distributor can be controlled and optimised during operation. • More gentle drying of the powder particles – suitable for sensitive products. • Can be retrofitted into existing spray dryers. 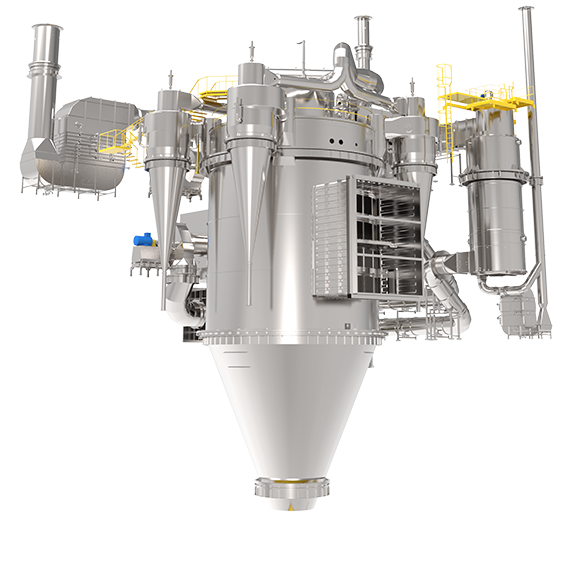 In spray drying, LARSSON can supply the whole product range from a single HID™ Air Distributor to complete high efficient turnkey spray drying plants. LARSSON delivers the whole range of equipment for the starch processing industry from single machines to complete starch-processing plants. www.larssonsweden.com which is our public website, like many other websites, can store or retrieve information in your browser, usually in the form of cookies. This information that may be about you, concern you, your interests, or your internet device (computer, tablet, or mobile) is mainly used to make the site work to your expectations, and to give you a more personal experience of the web, as well as to store your previous choices to memory. These cookies will help us to find out how our visitors use our website, so that we can judge how well it works and what can be improved upon. For instance, by using these cookies, we can find out which web pages are the most and least popular. They measure the number of visitors, how long they spend on our website and how they found the website in the first place. We can find out what we are doing well and what we can do better, as well as ensure that the web pages are loaded quicker and are correctly displayed. All information collected by these cookies is anonymous and not linked to any personal information about you. For more information on how this works, you can look in the browser’s help information section. G. Larsson Starch Technology AB would like you to leave certain information about yourself for our business operations. Your personal data is processed and saved by us so that we can fulfil our committment, take contact or provide the requested information. The personal data that may be used is primarily the information that you submit to us, directly or indirectly, when contacting us. The data that we collect and use includes name, telephone number and email address. You decide whether you would like to provide any information to us. The data will be used only by us, except for those cases where we are dependent upon a third party to fulfil a delivery, in which case they will also be able to use the data. We intend to use the data as long as you are a customer or have expressed a wish to receive information or offers from us. You have the right, under Section 26 of the Personal Data Act (1998:204), to be informed, free of charge, once a calendar year, and after a written application has been submitted to us, about which of your personal details we are using, and how we are using them. You also have the right to request a correction in accordance with section 28 of the Personal Data Act regarding personal data that we are processing about you. You are also always entitled to withdraw your consent in writing. If you consider that your personal information has been processed incorrectly, you have the opportunity to file a complaint with the supervisory authority (Data Inspection).